For Easter 2015 Bex and me decided to visit my parents in Dumbarton. 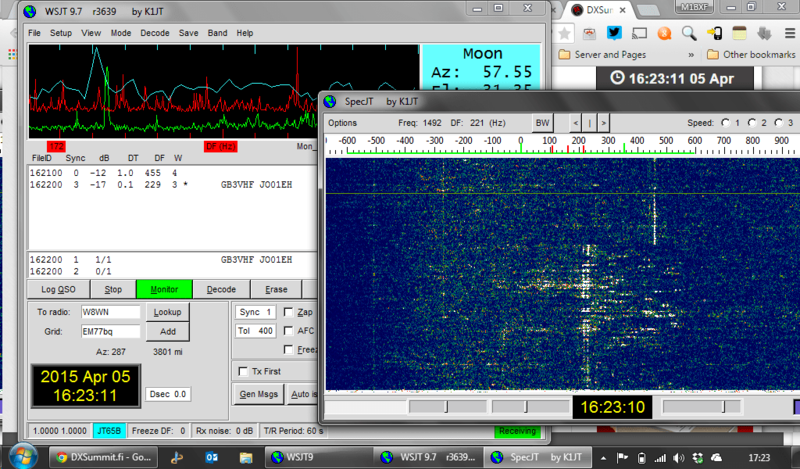 While there I took the time to catch up with Stevie MM6ZFG a couple of times to play radio. The first location we operated at was at Kilcreggan where Stevie knows the son of a farmer who has land on a south facing hillside. In the past Stevie checked the site out and found that the Northern Irish 2m FM repeater was S4 at a point lower down the hill from the 134m ASL spot we stopped at, it was actually weaker on the vertical the further up the hill we went but was S9 with the beam in vertical polarization; here is the view to the south west towards Arran. On 6m 2E1IIP @221Km was very strong, but due to high noise (QRN) at Roberts end, it stopped him hearing me so we couldn’t complete the QSO. He later called me on SSB and was 55, but again he couldn’t hear me so no QSO was made (note the high noise at the start of my RX period is something to do with the AGC in my soundcard, which i need to look into). 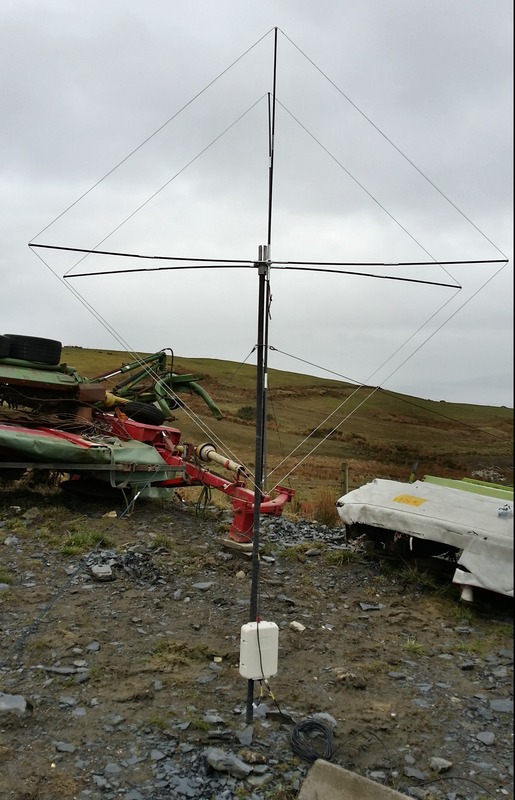 In the end we both had no QSOs on VHF unfortunately, so we then took the VHF antennas down and put some HF antennas up, in my case a 7m vertical with radials and an Icom AH-4 ATU at the base to tune it on any band between 80m to 6m as required. I jumped onto 40m and had a few QSOs, those were with 2E0SQL, M1ACB & G4OO, after that QRM from some Russian stations became unbearable so I went QRT. 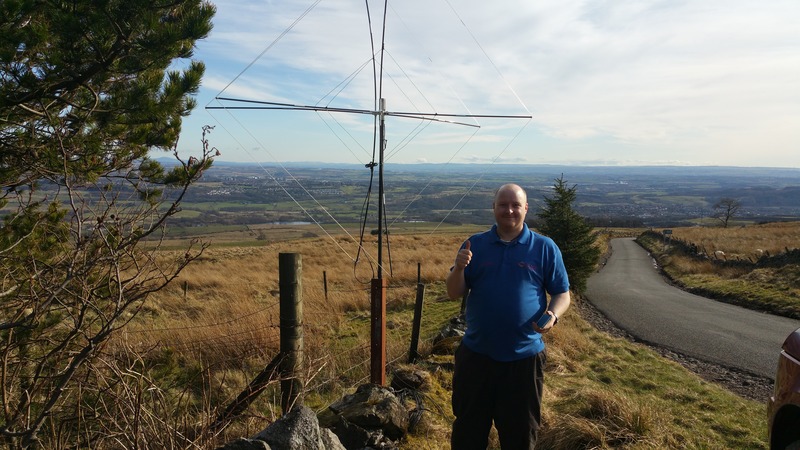 While the weather was good Stevie and myself decided to head out and play radio again, plus Bex was off shopping to Glasgow with my mum… Stevie and I started the day at the Lomond Radio Club where Stevie is currently attending an Intermediate Exam course on Sunday mornings. 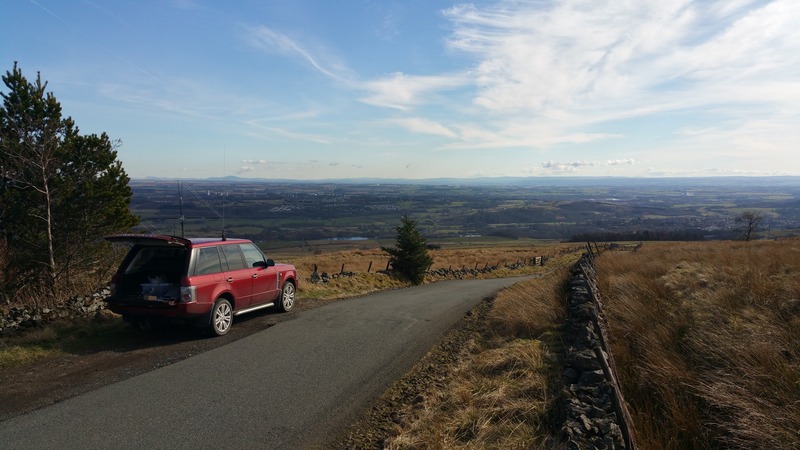 After that we headed out for a drive with no real plan and ended up at one of the best sites in central Scotland for VHF operating, a south facing carpark at 318m on the “Tak me Doon” road just north of Kilsyth which has a very sharp drop to the south. Also it’s in the rare IO76 (IO76XA) square. Here is the path profile from the carpark at 314m ASL to the south, note the average 8.7% slope! 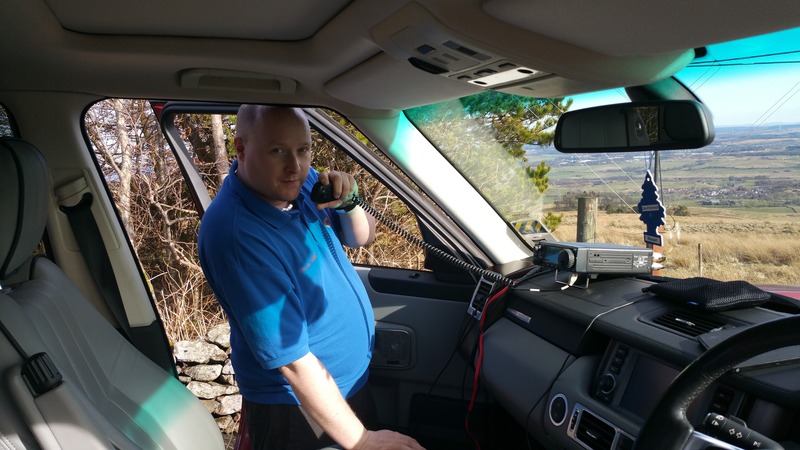 To start with we were rubbing our hands as we thought we should make a couple of QSOs on VHF as we could hear, and access, repeaters from Dundee (GB3AG) in the east to GB3NI near Belfast in Northern Ireland to the west, including GB3GD on the Isle of Man and GB3LA in Dumfries to the south – all were accessed using just using a Baofeng handheld and 5w! You get the picture of this location. We again we started with my 6m 2ele /P Quad in the hope of a little bit of activity, I need to do a write-up about it to better explain what my /P quad is, and with lots of hope and wishing some SpE, but after calling for 30 minutes straight, advertising my activity on ON4KST and self spotting on the cluster and Twitter I had ZERO replies, nothing. 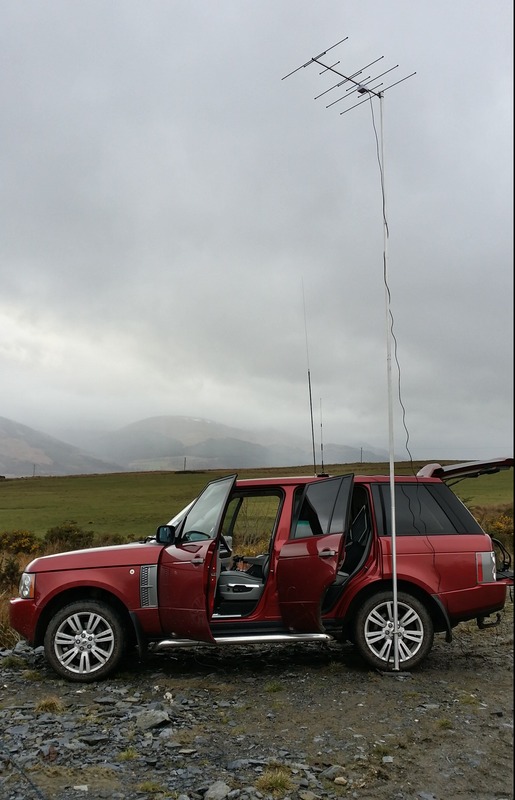 We thought 2m might be busier but Stevie had left his 4ele 2m beam +swaged pole mast at home due to space in the car earlier in the day so Stevie suggested we make a 2ele 2m quad with “what we had to hand and stick it on the 6m quad spreaders” as it would be fun, it couldn’t we worse than 6m could it? After realising we didn’t even have a tape measure we thought it was a great idea , we love a challenge, and got to it. To start with Stevie tried to get the dimensions of his phone from the web to use as a known length to measure wire against, then realised my Nvidia tablet was larger and would the time to measure less and went off looking for those dimensions, while he was doing that I looked up the measurements for a 2m quad I had in a file in my Dropbox where I also have the dimensions for my 6m quad. 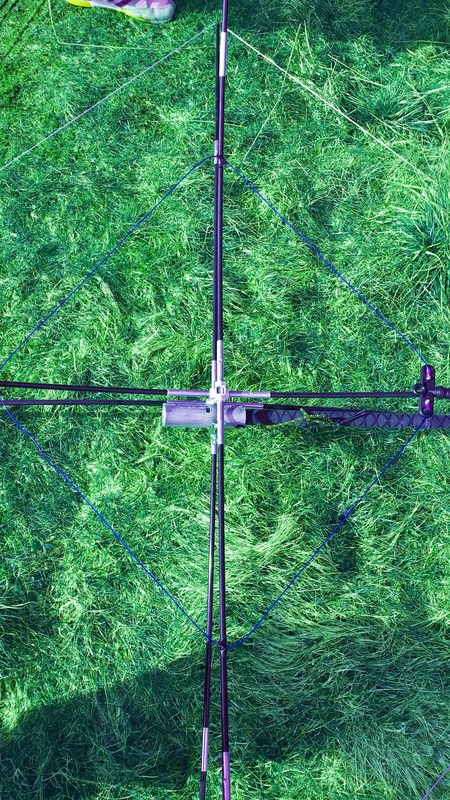 Based on what I had in the file the driven for a 2m quad should be around 2.12m and the reflector around 2.17m, while looking at the file I noticed the spreaders on my 6m quad are 1.07m long, so approx 1/2 what was needed for the 2m elements, so we cut a wire for the driven and reflector which started as 2x the 6m spreader length (1.07×2=2.14m) minus a couple cm for the driven and plus a few cm for the reflector! All very precision and scientific, it was a nice sunny day after all. After measuring the wire we used SO-239 dipole center for the driven and just soldered the reflector wire ends together to form a loop, we then taped it to the quad spreaders roughly so the sides were equal, got to keep that precision up. 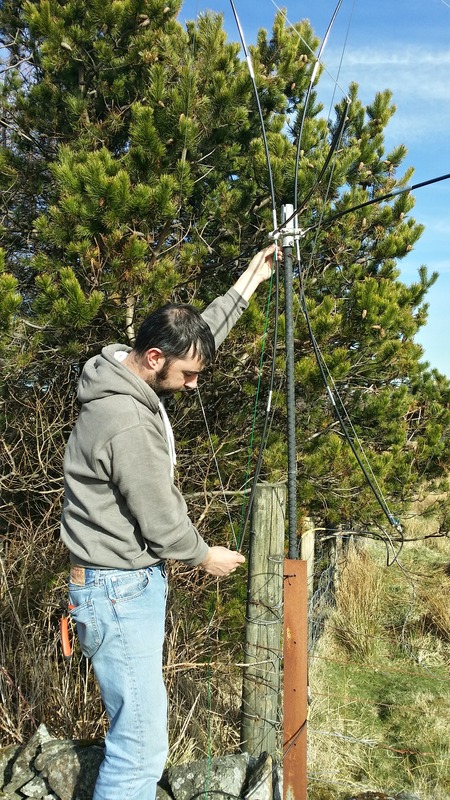 Here is Stevie measuring the wire needed in the left image and the wire taped to the spreaders on the right, it’s the inner wire (which is green against a green background) with the dipole center to the right. While I didn’t have my VNA to check it, my IC-706mk2G indicated it was happy enough producing full output power with no ALC and the inbuilt SWR showed 1:1 🙂 Happy days. 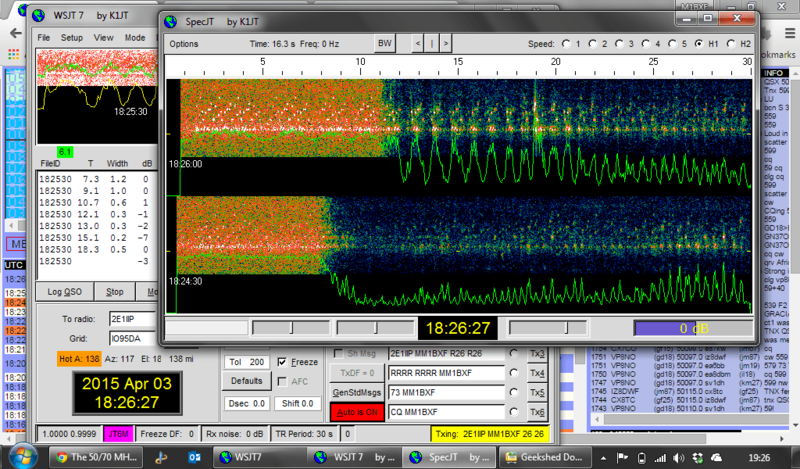 Checking the beacons GB3VHF/B was easily decoded over a path of 600Km on every period, the best decode was at –11dB. 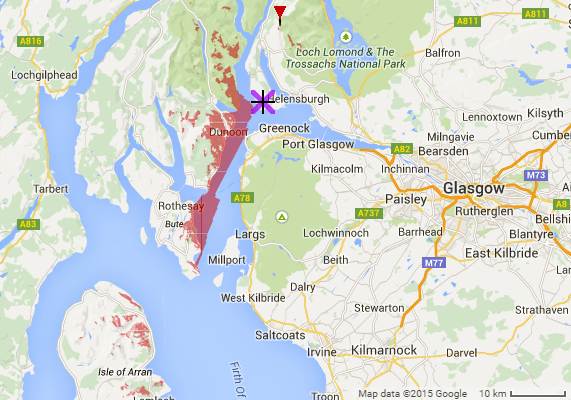 Checking other beacons, GB3NGI/B at 174Km was 579 and GB3ANG/B at 49Km was 599. Thinking the antenna can’t as good as I thought I pointed away from GB3NGI/B so the back was towards GB3NGI/B and the signal dropped from 579 to 509 meaning there must be some form of F/B, and a reasonable amount of it! Which testament to the precision of our design and construction. So I jumped on to 2m SSB with my IC-706mk2G which does 50w on 2m and spotted myself on the cluster and Twitter. After 20 minutes of calling CQ with the DVK I got my first and only answer, my one and only QSO was with Gordon MM0GPZ @ 28Km. Once I finished with Gordon I called on 2m for a few minutes again and John G4SWX in JO02 reports he could hear me very weakly which was good, I then checked GB3VHF which was still –17dB and decided to pack up and headed home for dinner as it seemed a better bet than making another QSO on 2m.